Volunteers: Part 3 (the sequel to the sequel). Look back at my blogs of 16th and 17th August for the first two parts of our experiences with (and without!) volunteers. I’m pleased to report that the friend of Emily’s that she promised, whilst profusely apologising for her own no-show, turned up at the local railway station on Wednesday evening, looking appropriately scruffy in a studenty-hippy-cycling-around-Europe-on-a-shoestring way. During our get-to-know-each-other chat in the van on the way home, he revealed that he had a degree in forestry management: truly a volunteer with added extras—bells and rings on, even. 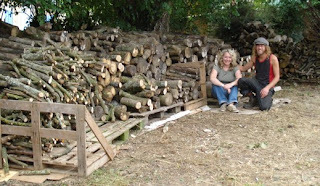 This was particularly appropriate, as top of the list-of-things-to-do-with-a-volunteer (a newly created sub-list of our perpetual list of things to do) was to go to our woods and collect all the wood I’d chopped and stacked last winter. His timing is particularly helpful, as I’m on a countdown to the first of the operations on my wrists (for carpal tunnel syndrome) next Tuesday when I’ll effectively become one-handed for a while. Thus, all the heavier jobs requiring two hands have risen in priority and collecting the logs was one of these. Many hands, some sort of machinery, or preferably both, would be useful, and Paul (our pig-farming neighbour) was generous yet again in lending us an old Massey Ferguson tractor and trailer. 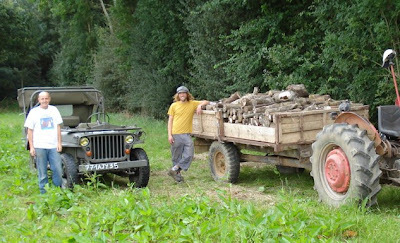 David (pronounced Dah-veed, as he's French) who lives at the entrance to the wood, was conscripted with the promise of a trailer-load of logs, so we were three. How to get the tractor near to the woodpiles was also an issue, as the previous owner of the woods had not made any provision for access when planting, some 20-odd years ago, and had never managed the woodland since. Until we chose a route for such access and cut it this winter, wrists and necessary permissions allowing, we needed an alternative, which was to drive over adjacent fields to get to the edge nearest the new coppice. I’d previously spoken the one of the farmers, Monsieur Bazy and agreed in principle that I could drive over his field after the wheat was harvested and before he ploughed it up. 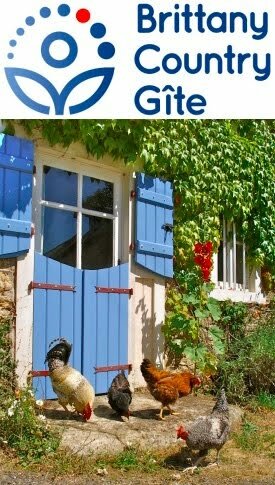 When I went round to see him and confirm this, we sat down and looked at the map and realised that I also needed access to the next field, owned by a different farmer, Monsieur Collet. He phoned him there and then, explained the situation, and permission was granted. The final preparations involved Gabrielle and I cutting two wheelbarrow-wide access holes through the hedgerow and mowing a track for the wheelbarrows to service all the woodpiles.